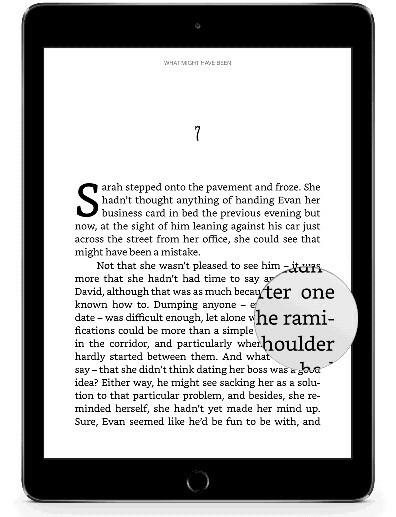 Yesterday Amazon introduced a new layout engine for Kindle ebooks with the latest update for the Kindle iOS app. Later in the day when Amazon officially announced the news, it was noted that the new layout engine is also now available on Kindle Fire tablets, and that it will be coming to other Kindle ereaders and apps this summer. It doesn’t seem like much on the surface but this is one of the biggest things to happen to Kindles in a long time. One of the most prominent issues with Kindle books is they’ve always been plagued by various typesetting problems. One of the most noticeable is the awkward spacing between words, especially with larger font sizes, because of the forced full justification. The new layout engine improves text justification and automatically adjusts margins and layout to better fit the screen with large font sizes. It improves word spacing and adds hyphens to split words. Other additions include kerning, drop caps, and a new font called Bookerly that is designed specifically for ebooks. Basically the new layout engine helps make Kindle ebooks look even more like print books. Not all people will be happy with that, of course, so it will be interesting to see how this all plays out. One of my biggest complaints with Kindles has always been the limited font and layout settings. I’ve always especially hated the awkward spacing between words and lack of hyphens, so much so that I started adding hyphens to Kindle ebooks manually with the Hyphenate This! plugin for Calibre. But I find it tends to be a bit too aggressive sometimes, adding too many hyphens, so it will be interesting to see how the new Kindle layout engine handles hyphens. Not all Kindle books support the new layout options. Amazon has to go through and re-code every single Kindle ebook for these new features to work. Here’s a short list of books that Amazon advertises as supporting the new layout. There doesn’t appear to be any way to tell from the product description pages unfortunately, so it’s impossible to tell when a book has been updated to support the new features. Kindle K3 Update too ? Amazon *could* solve the problem by just adding the same typography controls as Kobo & KoReader with respect to justification, gamma, user-fonts, etc. The route they’ve taken seems ridiculous since it requires changes to the ebook itself. The ebooks have to be recoded to add stuff like soft hyphens so there’s no way around that….